Gold Tunisian Francs are an inspired choice for collectors and investors thanks their gold content and superb design features. Gold Francs were issued in Tunisia from 1891 to 1958 during French rule and were replaced by the Dinar in 1960. These exotic coins are struck from 900/1000 pure gold and mintages were relatively low. 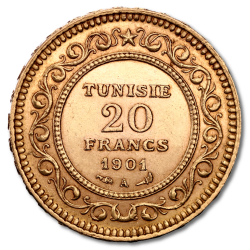 Tunisian Francs were issued with face values of 10 or 20 Francs although the coins were the same size in line with their French equivalents. You'll find Tunisian Gold Francs from mixed years at coininvest.com and all purchase are VAT Free to EU buyers.